Welcome to the brave new Berkeley! With the passage of Measure C, the district elections initiative, it's going to be a clean slate, if not clean of slates, come November. All eight council seats will be up for grabs, as well as the mayoralty, city auditorship, three seats on the school board, and five seats on the rent board. It is very likely that Berkeley will have to have its very own ballot this November to accommodate the anticipated large number of candidates. Consider this: if you got the number of votes Eldridge Cleaver scraped up in the November '84 election this November, you could win any district in the city. When the BCA activists and office holders who had predicted an easy victory-one was reported to have warned that it would be " undignified to press for too big a margin" rubbed their eyes and had a second cup of caffeine on the morning of June 4, the figures still 'said the same thing: Yes on Measure C, 15,490; No, 14,776. The measure that pledged to …end political squabbling" had passed by a 700-vote margin, out of an unusually low total of 33,053 ballots cast in Berkeley. If you've just woken up yourself, here's what Measure C will do: it divides Berkeley into eight geographical districts, each with about 7,500 voters. Each district will elect a councilmember every two years, with the mayor still elected at large. If no candidate receives an absolute majority, a runoff election between the top two vote-getters four weeks later will decide the issue. And a candidate in a runoff in early December could easily win with half as many votes as the La Rouchian challenger to Tom Bates got last Tuesday. Berkeley Citizens Action council majority. As though reading the enemy's script, Mayor Gus Newport and once-upon-a-time mayoral aspirant Veronika Fukson appeared throughout the Bay Area media flipping off the camera, and perhaps flipping off their future electoral chances as well. (Fukson explained that she was "only clowning around." Mayor Gus, who was out of town for most of the campaign, played his "arrogant" role to the hilt on election night. "What's happened between the dissidents in BTU [the Berkeley Tenants Union], the [Measure C campaign manager] Art Goldberg faction, BDC, and ABC [the Berkeley Democratic Club and the All Berkeley Coalition], I think they've created an unholy alliance and will self destruct themselves in November," Gus told KPFA. "It's just put us on notice that what we have to do is just destroy them once and for all." But what happened on election day was not a plebiscite on the bad attitude of some city officials. It was, in fact, a stark confirmation of everything that BCA had sworn would happen in the low-turnout runoff elections: the conservative minority would carry the day in progressive Berkeley. 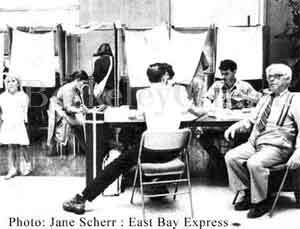 The primary factor in the splinterfication of Berkeley was the kind of turnout more commonly associated with state board of equalization races. How low was it? There were only half as many voters as in November '84, when the BCA swept into office. Fewer people voted than did in previous June elections: 6,500 less than June '84; 10,000 less than June '82. Aside from the Berkeley ballot, it was an election of unprecedented boredom. None of the top Democrats had any opposition, and unless voters felt a burning desire to fill the vacancy on Berkeley's rent board, there was really nothing to draw them to the polls other than the district issue. The results from the rent-board race are actually somewhat illuminating. As the votes from the last flatlands precincts came in early Wednesday morning, BCA-backed Florence McDonald edged ahead of a local landlady named Inez Watts. Before the absentee votes were tallied (which still could theoretically swing the election back to Watts), McDonald had 12,557 votes, Watts 12,248. Inez Watts was unknown, unendorsed, and had neither name recognition nor campaign; all she had going for her was her voter pamphlet description as a "small property owner." In this election, that was worth 12,000 votes. Florence McDonald states flatly that "The people who passed Measure C brought out the anti-rent control forces in the city who voted for Inez Watts." Still, those anti-rent control forces were not as large as they might first appear. The Berkeley Tenants Union's Jeff Jordan, scourge of state senator Nick Petris and implacable foe of such landlord-appeasers as Florence McDonald, received 3,517 votes. Taken together, the McDonald and Jordan votes added up to 16,000 votes-some 1300 votes higher than the total to vote against Measure C. Obviously a significant number of pro-tenant voters decided to vote against the BCA -a fact that political analysts have been trying gamely to understand. To the BCA, the most likely suspect is to be found in what is arguably one of the most deceptive pieces of campaign literature in recent Berkeley history. The Berkeley Democratic Club, now presided ever by former ABC councilmember (and possible future mayoral candidate) Andrea Washburn, sent out a voters guide all over Berkeley exactly in the style of the traditional BCA card: the same layout, the same candidates, the same color ink ("Most of the political mailing that's come out in this campaign has been blue and white," explained Washburn), the same Jane Scherr photo of Ron Dellums used by BCA. "Re-elect Congressman Ron Dellums arid Vote YES on Measure C" read the cover. On the other side, the card recommended Dellums and Bates along with Yes on C- even though both Bates and Dellums have taken strong public positions against C.
"I don't ever remember anything like-that in Berkeley," says Newport's aide, the Ubiquitous Sean Gordon. "I remember pictures of Brezhnev, but I don't remember people being so baldfaced as to hand out the opponents' leadership and say vote for us. It was deliberately deceptive, purely an attempt to trick people,. and conceivably enough to swing the election." Gordon's conclusion IS that the BDC decided they couldn't win without deceiving the voters. Needless to say, the Dellums and Bates people aren't very happy about it either. In an election with a 700-vote margin, a skillful deception like the BDC voters guide can easily make a large difference-it's easier to turn around 350 votes than pull out an extra 800. And pulling out the votes was exactly where the much-vaunted BCA electoral machine fell flat. "Despite very clear warnings from the campaign committee that if turnout dropped below 37,000 we would be facing a real battle," says a heated Sean Gordon, "people felt really overconfident, to the extent that some very prominent people were saying as close as three to four weeks before the election that we didn't have to run a very strong campaign." The BCA campaign was especially poor on campus and in South Berkeley. The campus operation was supposed to round up something like 3000 absentee ballots from the students, who would be on vacation by election day. Fewer than 1000 total absentee ballots opposing C eventually came in. The weak campaign in the black precincts couldn't even be saved by a last minute pitch from Jesse Jackson. What the campaign showed, in the view of one anonymous analyst, was that "BCA can no longer just throw their name on the ballot and expect to win." Finally, the BCA's most prominent elected officials didn't find it necessary to campaign until the closing days of the campaign, by which time it was too late. But even despite the lackluster campaign, when the precinct by precinct figures came in early this week they showed that the BCA's real problem was turnout. Moreover, they show that the power for Measure C came from the hills, with no significant erosion of BCA support in the flatlands, even in the areas destined to receive the controversial low income public housing that, along with an equally controversial closing of schools by the BCA dominated school board, was most commonly seen as generating the heat behind Measure C. A typical hills precinct showed a vote of 310-56; a typical flatlands precinct 87-16l. BCA support did not erode significantly in June-what eroded were the BCA numbers. In the · aftermath of the defeat, the BCA is undecided on how to respond to the new balkanized political landscape. "I think the runoff," advises Marty Schiffenbauer, whose title of "electoral maven" in Berkeley has been temporarily revoked due to excessive optimism. Schiffenbauer envisions something like a replay of his own "poison pill" Measure E this election, which would have nullified at least the runoff provision of C, if not the whole scheme. Last Tuesday, Measure E lost by less than 400 votes. A Son of E could be popular with the students in November, but would doubtless be characterized by the BCA's opponents as the council's way to flip off the will of the people. Other BCA strategists are urging the party to play along with the districts for a while, guessing that after the first couple runoff races are won by vote totals equivalent to the number of patrons in Brennans on a Saturday night the public might be more amenable to amending the measure. Either strategy, however, requires playing the game at least once. And that's going to be fun. District 1, Northwest Berkeley: A real catfight-Veronika Fukson and Nancy Skinner both live in 1, as do Clarence Kyle, Peter Sheats, Pam Sanford, and all the other original backers of Measure C who swore they weren't interested in political office for themselves. Some of the pressure may be relieved to the extent that some potential council candidates may become mayoral candidates. District 2, West Berkeley: A free for all. District 3, South Berkeley: Black on black on black: Wesley Hester, Maudelle Shirek, and Barbara Lashley all live here. District 4, Central Berkeley: Ann Chandler is ilie incumbent, but she's got a lot of ambitious neighbors, including school-board member Anna de Leon (who also may be more interested in the mayor's race), Center for Independent Living director Michael Winters and his old ally Anarea Washburn, Dan Lambert of the Berkeley Tenants Union, and Barry Wofsy, the first of the anti-slate "neighborhood" candidates. District 6, Berkeley Hills: There are jokes around BCA about sending a mailer to District 6 with Gus Newport on the cover endorsing Shirley Dean, the former ABC vice-mayor. Actually, the BCA will almost certainly write off the district entirely, and the once omnipotent hills will, in the future, · only be able to exert their disproportionate weight in city politics in races for mayor and city auditor. District 7, South Campus: Don Jelinek already lives here, but he might be taken by an urge to give up his law practice, and take a $600-a-month mayoral salary. District 7 is probably destined to become the home of the professional student candidate. District 8, Elmwood: John Denton could win here, with or without the backing of the BCA and probably without. BCA schoolboard director Barbara Lubin also lives here. The non-BCA field is still too nebulous to size up this early. The traditional slates of the BDC and the ABC, insofar as they still exist, are playing it coy. Meanwhile the new "November Coalition," an anti-BCA organization active in the Measure C campaign, is sending around a "Candidate's Survey" trying to identify possible candidates to back in November. "The candidates which the November Coalition supports will be competent, accessible, and responsible to the entire citizenry," they promise. (Some voters thought the idea of district elections was that the candidates would be responsible primarily to their district, but there you are.) "This process is unlike the BCA and ABC system," the November people go out of their way to point out, "where conventions of insiders decide on slates of the party elite, over which the people have no control." November Coalition leader Patrick Devaney angrily denies that the organization is forming a slate. Yet, he argues, "If any organization which is going to field candidates against the BCA just simply goes out of the business of campaign management, it would be a form of unilateral disarmament." The November Coalition won't call it a slate, but everyone else will. Glad we put an end to the political squabbling in Berkeley. My thanks to Michelle Riddle for providing research assistance for this story.